In Part 1 of this article, I provided an account of the Jewish role in the events leading up to World War One, with an emphasis on their influence in the UK and United States. Woodrow Wilson was shown to be the first American president elected with the full backing of the Jewish lobby, and he responded by placing several Jews into leading roles in his administration. They were also seen as having decisive influence at the time of Wilson’s declaration of war in April 1917. On the British side, Prime Minister David Lloyd George was a Christian Zionist and ideological compatriot of the Jews, and equally eager to support their aims. Britain leveraged Jewish support through the Balfour Declaration of November 1917, which promised the Zionists a homeland in Palestine; it was their reward for their having brought the US into the conflict some seven months earlier. Such actions were shown to be part of a long-standing historical trend: one of Jewish activists and agitators inciting turmoil and even war whenever they stood to benefit. Wars, of course, are not only events of great death and destruction; they provide tremendous opportunity for financial profit, and for dramatic shifts in global power structures. For those in the right position, warfare can yield significant gains in wealth and influence. Specifically, the events surrounding the First World War brought substantial gains to Jews worldwide—in several ways. First, with highly-placed individuals in the Taft and Wilson administrations, the US was very amenable to Jewish immigration; in fact their numbers increased dramatically, from 1.5 million to over 3 million between 1905 and 1920—on the way to 4 million by the mid-1920s. Second was the Balfour Declaration, which promised them Palestine. Granted, nothing was immediately delivered as to Palestine, but even so, it was a major concession by a world power. Third, the world order was changed in their favor: the hated and “anti-Semitic” Czarist rule in Russia was replaced by the Jewish-led Bolshevik movement, the hated and “anti-Semitic” Kaiser Wilhelm II of Germany was replaced by the Jewish-friendly Weimar regime, and the Jewish-influenced governments of the US and Great Britain reestablished their global dominance. Finally, and as always, there was money to be made. Running the War Industries Board for Wilson, Jewish Financier Bernard Baruch had extraordinary power to direct military spending; we can be sure that his preferred clients benefitted. But perhaps Nebraska Senator George Norris said it best. 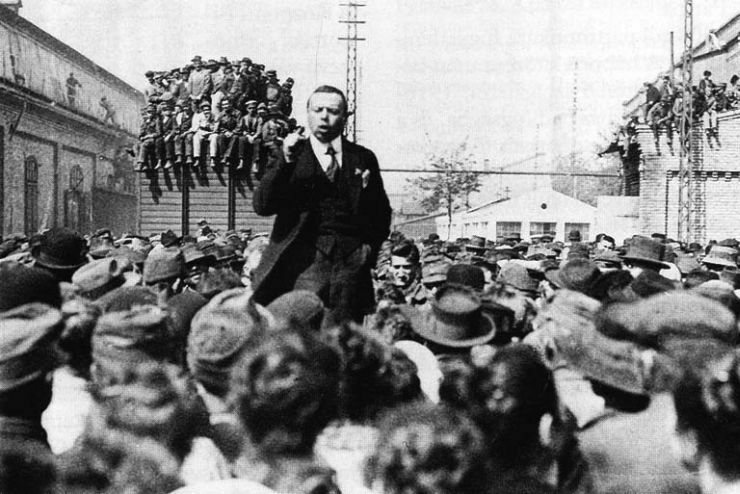 Speaking in opposition to Wilson’s call for a war declaration, Norris exclaimed that Americans were being deceived “by the almost unanimous demand of the great combination of wealth that has a direct financial interest in our participation in the war.” Furthermore, “a large number of great newspapers and news agencies of the country have been controlled and enlisted in the greatest propaganda that the world has ever known, to manufacture sentiment in favor of war.” Summarizing his case, Norris said this: “We are going into war upon the command of gold.” Finance, media, ‘gold’—Jewish interests prospered on many fronts. But Wilson was evidently unaffected by such matters, or by his pledge to his fellow Americans to “keep us out of war.” His team of Jewish backers and advisors—Baruch, but also Henry Morgenthau Sr., Jacob Schiff, Samuel Untermyer, Paul Warburg, Stephen Wise, and Louis Brandeis—wanted war, and war they got. The fact that it would cost America $250 billon (current equivalent), and some 116,000 war dead, did not seem to figure into their calculations. The main topic of the present essay is World War Two, but its roots lie in the outcome of the First World War. I therefore continue the story from that time. This naturally generated deep hostility toward the House of Romanov, and many Jews sought its demise. Special animosity was reserved for Czar Nicholas II, who assumed power in 1894. In Part 1, I explained the stunningly successful effort of the American Jewish lobby to abrogate the long-standing US-Russia treaty in 1911; this was a small punishment aimed at the Czar. The ultimate goal, though, was his overthrow, and thus we can imagine the joy of the global Jewish community at his fall in March 1917. As we recall, the Czar and his family were then murdered by Jewish Bolsheviks in July of the following year. It was a somewhat similar story with the German ruler Wilhelm II, who acceded to the throne in 1888. There, however, Jews were prosperous and enjoyed a relatively high degree of freedom—despite the Kaiser’s evident personal dislike of them. Previously I cited some impressive statistics by Sarah Gordon regarding their numbers in law, media, business, and academia, all prior to World War I. In the banking sector, they utterly flourished; prominent German-Jewish banking families included the well-known Rothschilds and Warburgs, but also the Mendelssohns, Bleichroeders, Speyers, Oppenheims, Bambergers, Gutmanns, Goldschmidts, and Wassermanns. But despite their wealth and success, Jews had no access to political power, owing to the hereditary monarchy. This, for them, was unacceptable. Thus they had to introduce “democracy”—with all due high-minded values, of course. Only through a democratic system could they exert direct influence on political leadership. Strangely enough, Wise got his wish. Within two weeks, America was in the war. And about 18 months later, Wilhelm would succumb to uprisings in the ranks of his forces and be compelled to abdicate. Having won the war, Wilson’s Jewish team was anxious to dictate the peace. “As it turned out,” remarks Robert Shogan (2010: 25), “the war would bring benefits to the Zionist cause, in part because of Brandeis’ role as a trusted advisor [to Wilson].” The victorious nations convened in Paris in January 1919, and the American Jewish Congress was there as its own delegation. Shogan adds that “[Stephen] Wise was in Paris, on assignment from President Wilson to head the Zionist delegation to the peace talks.” (One might reasonably ask: Why do Zionists get their own delegation at all?) Louis Marshall was also prominent there among the American Jews. The Jewish aim was neither a just implementation of peace, nor fair treatment of Germany, but rather to maximize benefit to the various Jewish communities of Europe and the US. “At the beginning of 1919,” says Ben-Sasson (1976: 940), “diplomatic activity in Paris became the main focus of the various attempts to fulfill Jewish aspirations.” Fink (1998: 259) concurs: “In March 1919, pro-Zionist and nationalist Jewish delegations arrived in Paris.” Nearly every victorious nation, it seems, had its own Jewish representatives. Some sought formal and explicit Jewish rights in their own nations, and others worked for recognition of a Jewish national state. Polish Jews were notable beneficiaries; they succeeded in achieving explicit mention in the Polish Treaty for Minority Rights. Among non-Jewish Americans there was a young Herbert Hoover, then-Secretary of the US Food Administration, and of course, future president. He was accompanied by a Jewish assistant, the financier Lewis Strauss, who remarked on his boss’s notable inclination to “champion Jewish rights,” especially in Poland. [5 ] Strauss would later become instrumental in funding early development of the atomic bomb. Treatment of the Germans at the conference, as is well known, was brutally harsh. They expected, and were promised, that the conference would be a fair settlement of the legitimate war claims of all belligerents—particularly given the complex and convoluted nature of the outbreak of hostilities. (We recall: the Archduke was assassinated by a Serb in June 1914; the Russian army mobilized and massed on the German border in July; a threatened Germany declared war on Russia in August; a Franco-Russian Pact required a simultaneous declaration against France; and Britain declared war on Germany as soon as Germany’s army crossed into Belgium.) By the time of the Peace Conference, Wilson and his team had decided that Germany alone was responsible for the war, and thus had to bear the full burden of reparations. [6 ] The impossible conditions forced upon them set the stage for the rise of National Socialism and the next great war. America, which had no legitimate interest in the battles in Europe, was drawn in by Wilson’s compliance with Jewish demands. For his part, Wilson comes across as something of an amoral political schemer. MacMillan (2010: 7) describes his close, “possibly romantic,” relationships with several other women during his first marriage. Theodore Roosevelt viewed him “as insincere and cold-blooded an opportunist as we have ever had in the presidency” (ibid: 6). To Lloyd-George, he was “tactless, obstinate, and vain.” Granted, we all have our faults; but for most of us, they do not lead to national catastrophe. In other words, Jewish anarchists and militant communists (“new forces”) conducted violent insurrection (“new horizons of activity”) aimed at overthrowing the ruling governments, and installing Jewish-led regimes. Bermant (1977: 160) confirms this point: “most of the leading revolutionaries who convulsed Europe in the final decades of the last [19th] century and the first decades of [the 20th], stemmed from prosperous Jewish families.” This again is in keeping with the longstanding trend of Jewish rebellion. Consider Hungary, for example. There, a Hungarian Jew named Béla Kun (Kohn) founded and led the local wing of the Russian Communist Party in early 1918 that later became an independent entity. Along with Jewish colleagues Matyas Rakosi (Roth/Rosenfeld) and Otto Korvin (Klein), Kun’s party organized numerous strikes and conducted violent and subversive attacks against President Karolyi and the ruling Social Democrats. In March 1919 Karolyi resigned, and the SD Party proposed an alliance of necessity with Kun’s communists, in the hope of leveraging his connections to the Russian Bolsheviks. Kun agreed to the proposal, on the condition that the government reestablish itself as the “Hungarian Soviet Republic,” which it did. Kun dominated the new government, filling many top seats with Jews; as Muller (2010: 153) explains, “Of the government’s 49 commissars, 31 were of Jewish origin.” He fended off a coup attempt in June, and then conducted what came to be known as the “Red Terror”; this was a paramilitary group, led by Jewish ideologues Georg Lukacs and Tibor Szamuely, that hunted down and killed members of the local opposition. Unfortunately for Kun, ongoing conflicts with neighboring Romania led to an invasion of Hungary, and the promised Russian aid never materialized. Kun and his fellow Jews were driven out in August, just 133 days after taking power. It was not only Russia and Hungary that had problems. “Jews had a prominent role in Communist parties elsewhere,” explains Bermant (172). In Poland, for example, “about a quarter of party members and about a third of delegates to party congresses were Jews.” The Polish Communists were unable, however, to generate sufficient force to oust the newly-established government of Józef Piłsudski. It was in Germany, though, that the most significant actions occurred, ones that would have a lasting effect. We need to recall events at the end of World War I. Long a stalemate, the war had essentially become a battle of attrition. American forces on the ground in mid to late 1917 threatened to change things, but for the Germans, the western front generally held up—even to the very end. At no point in time did it ever retreat into German territory. But even though the Germans were able to hold out, their allies could not. Bulgaria and the Ottoman Empire surrendered by the end of October 1918. Austria-Hungary yielded in early November. For the Germans, though, the last straw was their problems at home—with the Jews. Trouble began with a minor naval mutiny in late October and early November 1918 at the ports of Kiel and Wilhelmshaven. A number of sailors, workers, and Jews from the Independent Social Democratic Party (USPD) joined forces to conduct a nonviolent rebellion against the Kaiser. The German rebels simply wanted the war to end, whereas the Jewish rebels sought power; in this sense it was a natural alliance. The “rebellion”—primarily in the form of a general strike—quickly spread, reaching Munich within a matter of days. In an attempt to cut short this action, the majority Social Democrats (SPD) called on the Kaiser to abdicate, at which time they would form a republican government. On November 9, they prevailed; Wilhelm stepped down and a new “German Republic” was proclaimed. It was this new leadership that signed the armistice agreement on November 11, ending the war. The USPD rebels, however, had their own plans. On the very same day that the German Republic was created, they declared the formation of a “Free Socialist Republic.” This group had an almost entirely Jewish leadership: Rosa Luxemburg, Hugo Haase, Karl Liebknecht (half-Jewish), Leo Jogiches, Karl Radek (Sobelsohn), and Alexander Parvus (Gelfand) were the dominant figures. And these were just the activists centered in Berlin. In Munich, other Jewish rebels were conducting a separate, simultaneous revolution, aimed at creating a Bavarian communist state. The leading USPD revolutionary there was a Jewish journalist, Kurt Eisner. On November 7, he demanded the abdication of the local monarch, King Ludwig III. The king fled on the following day, and Eisner declared himself “Minister-President” of a free Bavarian state. Kurt Eisner demanded the abdication of King Ludwig III on November 7, 1918. The King fled on the following day, and Eisner declared himself “Minister-President” of a free Bavarian state. Soon enough, though, Eisner’s luck ran out. On 21 February 1919, he was assassinated by a fellow Jew, Anton Arco-Valley. Within a few weeks, other USPD Jews regained power and established a Bavarian Soviet Republic—the third in Europe, behind Russia and Hungary. Its leader was the Jewish playwright Ernst Toller. 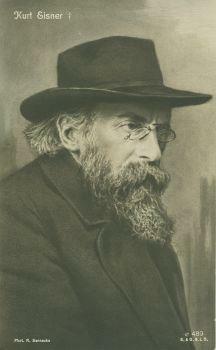 Among his group were the noted Jewish anarchists Gustav Landauer and Erich Muehsam. Through sheer incompetency, Toller’s government managed to get usurped by yet another Jewish faction, one led by Eugen Levine and the half-Jew Otto Neurath. Levine attempted to institute a true communist system, including its own “Red Army” modeled on the Russians’. But once again, his success was short-lived. Remnants of the old German army quickly intervened, deposing the communists in early May. Things did not end well for the Jewish rebels. Levine was captured and executed, as was Landauer. Toller, Muehsam, Radek, Parvus, and Neurath managed to escape. Luxemburg and Liebknecht were shot by German soldiers in January 1919, and Jogiches died under mysterious circumstances in March. Haase was killed by a deranged worker in November of that same year. In post-war politics any number of Jews rose to leadership. Both in the Reich and in the Federal States, Jews, particularly Social Democrats, became Cabinet Ministers. In the bureaucracy, the Jews rose rapidly to leading positions, and until about 1930 their number seemed on the increase. Summing up the situation, he observed that, “in short, after the Revolution, the Jews came in Germany to play in politics and administration that same considerable part that they had previously won by open competition in business, trade, banking, the Press, the arts, the sciences, and the intellectual and cultural life of the country” (228). It was this very centrality of Jews to social upheaval, the November Revolution, and the new Weimar Republic that led three German activists and intellectuals—Anton Drexler, Gottfried Feder, and Dietrich Eckart—to found the Deutsche Arbeiterpartei (DAP) in January 1919. This would be the forerunner to the National Socialist DAP (NSDAP), or Nazi Party. One of their first recruits was a distraught 30-year-old former soldier, Adolf Hitler. 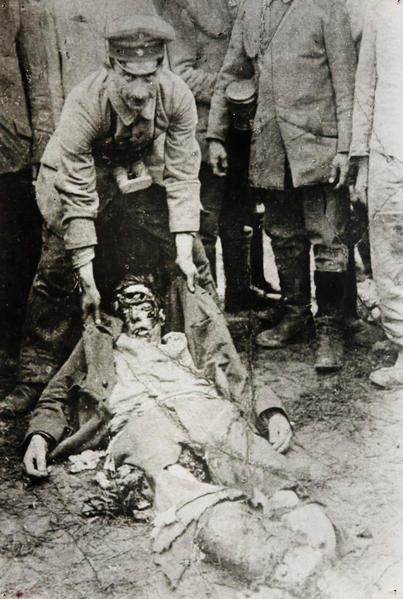 Hitler returned to the front in March 1917, and was struck by a mustard gas attack in October of the following year. The gas severely burned his eyes, sending him to a military hospital for recovery. It was there that he first heard about the revolution. The Jewish-Marxist “gang of despicable and depraved criminals” had led the overthrow of the Emperor and were attempting to take direct power themselves. Their revolts would be transitory, but the Jewish-influenced Weimar regime would soon take control of the nation, and this was scarcely any better. It was these events that led Hitler to become politically active. This was a recurrent theme in Ford’s “International Jew” series. Meanwhile across the ocean, Lenin (a quarter-Jew) and his Jewish Bolshevik colleagues established the Soviet Union in December of 1922. The next year, Hitler and others within the NSDAP launched a failed coup attempt in Bavaria, leading to his 12-month imprisonment and consequent writing of Mein Kampf. In early 1924, both Lenin and Woodrow Wilson died within a month of each other. Little of note occurred during the mid- to late-1920s. Jewish immigration into the US continued to expand, with their numbers surpassing 4.3 million by 1927. Jews made further inroads into Hollywood; Marcus Loew acquired MGM studios, the Cohn brothers took over at Columbia Broadcasting System, and David Sarnoff founded RKO Pictures. In the political sphere, the Republican and Christian Zionist Herbert Hoover won the presidential election of 1928, and a relatively unknown Democrat, Franklin D. Roosevelt, won the governorship of New York. From the start, FDR had close and persistent ties to American Jews—ties that would prove decisive to his actions in the Second World War. His running mate in New York was Herbert Lehman, the son of German Jews. (His Republican opponent, Jewish Attorney General Albert Ottinger, failed to draw the Jewish vote that FDR did; this says something about the strength of FDR’s connection to that group.) Upon assuming the governorship, Roosevelt “filled a number of key positions from the state’s large Jewish population,” according to Shogan (2010: 5). One of his first major appointments was his longtime friend Henry Morgenthau Jr. to the New York State Agriculture Committee. He also named a former speechwriter, Samuel Rosenman, as “counsel to the governor.” Both would play important roles in his presidency. 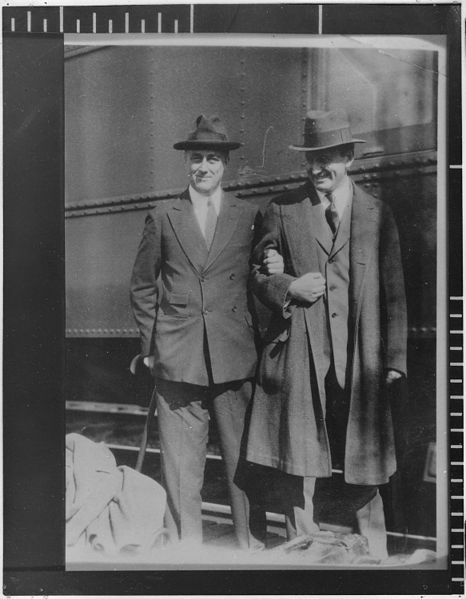 Franklin D. Roosevelt arm in arm with Henry Morgenthau Jr. The same election that put Roosevelt in the governor’s seat placed Hoover in the presidency. As I noted earlier, he had long championed Jewish interests. As president, Hoover did his part for the Hebrews, naming Eugene Meyer Fed Chairman in 1930, and appointing the second Jewish justice, Benjamin Cardozo, to the Supreme Court in March 1932. But by then the Great Depression was well underway, dooming any chance for reelection. Before turning to FDR’s long and historic stint as president, I want to recall a question I raised in Part 1 of the present series: Was Roosevelt Jewish? Previously I noted that his fifth cousin Theodore claimed to be Jewish, according to former Michigan governor Chase Osborn. I have yet to find any independent confirmation of this assertion, though there seems to be no reason why Osborn would lie about such a thing. Both were good Republicans, after all. But more to the point, Osborn would have much to say about FDR, as I will explain momentarily. Franklin left many clues to a possible Jewish heritage, beginning as far back as 1914. In a letter to a friend upon the birth of his son Franklin Jr., he wrote that he had considered naming him Isaac—a classic Jewish name, and one shared by both his grandfather and great-great-grandfather. But the family resisted: “this name is not met with enthusiasm, especially as the baby’s nose is slightly Hebraic and the family have visions of Ikey Rosenvelt, though I insist it is very good New Amsterdam Dutch.” For Shogan this is a sign of latent anti-Semitism, but I find that an unlikely excuse. What true anti-Semite would admit that his newborn son looked Jewish? Or would contemplate a Jewish name? More likely it was an inside joke, of the kind that people might say to family or close friends about a particular ethnic heritage within one’s own background. Twenty years later, another clue. In 1934, now-president FDR gave a photo of himself and Henry Morgenthau to Henry’s wife. It bore this inscription: “For Elinor from one of two of a kind.”Yes, but two of what kind? Democrats? Americans? Jews? An oddly suggestive remark. That same year saw the publication of an enlightening interview with Osborn, one that would initiate a prolonged discussion on FDR’s heritage. The 8 February 1934 edition of the St. Petersburg (Fla.) Times carried an interview in which Osborn claimed that the Roosevelts were descended from the Rossacampos, a Jewish family expelled from Spain in 1620. That family spread out into Europe and altered their spelling according to the various places where they took root: Rosenberg, Rosenblum, Rosenthal, and in Holland, Rosenvelt. “The Rosenvelts in north Holland finally became Roosevelt,” claimed Osborn—which in fact seems to be true: the family patriarch, Claes van Rosenvelt, immigrated to the US in 1649. His son Nicholas apparently dropped the ‘van’ and changed the spelling to the familiar form. Once again this is a suspiciously circumspect reply by FDR. For him to say that his relatives “may have been Jews” sounds very much as if he knows this truth, does not want to openly acknowledge it, but cannot quite bring himself to lie about it. Slomovitz planned to publish the reply in his Detroit Jewish Chronicle. Before he could do so, the New York Times got wind of it and carried the text in their issue of March 15—on page 1. Slomovitz passed this reply on to Osborn, who repeated his original assertion in a return letter of March 21: “President Roosevelt knows well enough that his ancestors were Jewish. I heard Theodore Roosevelt state twice that his ancestors were Jewish. Once was to me when I asked him about it after he had made a pleasing euphemistic statement in a speech to a Jewish gathering” (ibid: 6-7). Osborn is adamant. And it is important to note that he does not take this Jewish heritage as a slur; in fact, quite the opposite. He is evidently a Christian Zionist (and Republican), and thus views it as a redeeming quality. As such, he would likely not cast the Democrat Franklin in this positive light unless he actually believed it to be true. It seems that he was talking from a factual, if unconfirmed, basis. If Slomovitz was inclined to doubt Osborn’s claim, another letter would soon fortify his belief. On March 27 he received a note from none other than Rabbi Stephen Wise of New York City. Wise had evidently seen the New York Times story, and wrote to confirm it. In his letter he recounts an “almost literal transcript” given to him by his wife, who had previously attended a luncheon with Roosevelt’s wife Eleanor—who said the following: “Often cousin Alice and I say that all the brains in the Roosevelt family comes [sic] from our Jewish great-grandmother” (ibid: 9). She then allegedly added a name, ‘Esther Levy.’ The Alice in question was the oldest child of Theodore; Eleanor’s father Elliot was his brother. Their common great-grandmother would have been either Margaret Barnhill or Martha Stewart—neither of whom appears to be Jewish, unfortunately. And we have no record of any Esther Levy in the Roosevelt lineage. A bit of a mystery. The letter then takes a little twist. Eleanor continued: “Whenever mention is made of our Jewish great-grandmother by cousin Alice or myself, Franklin’s mother [Sara Delano] gets very angry and says, ‘You know that is not so. Why do you say it?’” Another puzzling remark, and one that Wise leaves unexplained. Wise closes the letter with his own assessment: that Roosevelt “knows what I [Wise] have just written to be true, but deems it wiser and more expedient not to make any public mention of it at this time.” The letter, after all, was marked “Strictly private and confidential.” Wise adds that “you [Slomovitz] must not, however, make use of this. I think it is just as well to let the matter die down now.” A strange series of comments, to be sure. Many years later, a final small clue appeared. From the mid-1920s to mid-1930s, Franklin’s daughter Anna was married to a stockbroker named Curtis Dall. After having two children, they divorced in 1934. Three decades later Dall published a book, FDR: My Exploited Father-in-Law(1968). In it we read this sentence: “As I gathered it, the background of the Franklin Roosevelt family was a composite of English, Dutch, Jewish, and French stock” (98). There is no further elaboration. In the end, many questions remain, but it seems possible that the Roosevelts were at least in part Jewish. Perhaps the larger question is this: Does it matter? I believe it does, on two counts. First is the basic matter of historical accuracy; if we did in fact have a partially Jewish president, or rather two such presidents, the history books ought to reflect this reality. Likely other relevant evidence exists in the vast presidential archives, and an open admission might bring this to light. Second and more important is the effect this may have had on FDR’s actions prior to and during World War II. With even a partial Jewish heritage, he may have been more sympathetic to the Jewish cause, more amenable to Jews within his administration, and more likely to sacrifice on behalf of Jewish interests. The evidence shows that all these things actually happened—which is precisely why “Franklin Roosevelt was the first great hero of American Jews” (Shogan 2010: xi). The ‘family connection’ would certainly help to explain such things. Alternatively, and as is often the case today, it could have been strictly a matter of money—of rewarding those who paved one’s way to the top. But perhaps the strongest case is this: that it was a combination of both. If FDR was predisposed by his heritage to be sympathetic to the Jews, and they also stepped forward to fund his campaigns and support him in the media, these would then be powerful incentives to reward them within his administration, and to be swayed by their concerns when it came time to deploy American military power. I examine that case now. that the US entered the war under false pretenses. I will provide specific data on the first two points, and then address the remaining ones collectively. The first rule in politics is to reward those who finance your path to success. Thus it is unsurprising that “[FDR’s] administration contained a higher proportion of Jews than any other” (Michael 2005: 178). In the words of Herzstein (1989: 40), “Jews were indeed more prominent than ever before in American history.” So who were these leading figures that were so dominant during the Roosevelt years? At the top of the list were the Big 5, the “President’s Jews” as Shogan says, who had the largest hand in swaying events within the presidency: Louis Brandeis, Felix Frankfurter, Henry Morgenthau Jr., Sam Rosenman, and Ben Cohen. Brandeis was of course a sitting Supreme Court justice long before Roosevelt ran for office, having been placed there by his friend Woodrow Wilson in 1916. Even prior to his initial election in 1932, FDR arranged a meeting with Brandeis to discuss policy. According to Shogan (2010), the Justice soon sent Roosevelt “a broad blueprint for the New Deal” (72). Some years later, in 1938, “Brandeis made his first call on FDR on behalf of the Jews” (83). Such involvement in government administration by a Supreme Court justice is unusual, to say the least. Others would call it flagrantly unethical. Justices are supposed to rule on constitutional matters, not make policy. He obviously knew this, and thus generally worked through Jewish intermediaries, like Frankfurter and Cohen, to get his message to the president. On a day-to-day basis, Frankfurter was particularly important. Even by 1933 he had become “probably FDR’s most influential advisor” (ibid: 105). Incensed at the extent of his power, American General Hugh Johnson called him “the most influential single individual in the United States” (86). Frankfurter, he said, “had insinuated his boys into obscure but key positions in every vital department” related to the New Deal. Later, when Europe was on the brink of war, Frankfurter was apparently instrumental in initiating a series of secret correspondences between FDR and Churchill at a very sensitive time—neutral presidents are not supposed to be conducting secret negotiations with leaders of belligerent nations. Frankfurter, as we know, would be well rewarded by Roosevelt for his efforts, with the nomination to the Supreme Court in January 1939. Moving down the list: Roosevelt “was as close to Henry Morgenthau…as to any man” (ibid: 32). So close, in fact, that Franklin would make him the second Jew ever to join a presidential cabinet; he was named Secretary of the Treasury in early 1934, serving right through the end of the war. Henry would later author the notorious “Morgenthau Plan”—a policy for the virtual destruction of postwar Germany. This again was an outrageously out-of-line effort by a treasury secretary, who formally has no business conducting foreign policy. But this evidently did not stop him from trying. But more importantly, Cohen was the lead architect and executor of the infamous ‘bases for destroyers’ plan of mid- to late-1940. At that time Britain was well into the war and badly needed military assistance from the US. But as a neutral nation, and by law, the US was unable to help. Cohen then concocted a plan by which America would “loan” 50 warships to the UK in exchange for the use of certain global bases that they held. “Employing hairsplitting technicalities and unprovable assertions about national defense, [Cohen’s] memorandum stretched the law, creating a loophole wide enough for fifty warships to steam through on their way to join the Royal Navy,” says Shogan (152). Seeking legal approval for this blatantly illegal action, Roosevelt turned to…Justice Frankfurter. And to no one’s surprise, the Justice conferred his blessing. The Brits, of course, were elated. For the Germans, this was a veritable act of war by the nominally neutral Americans. Most fatefully, it seems to have been decisive in causing Hitler to sign a mutual-defense pact with Japan in October 1940; it was this agreement that would trigger Germany’s declaration of war on the United States following the attack on Pearl Harbor. Beyond the Big 5, several other Jews played influential roles. Bernard Baruch, another Wilsonian holdover, was a part-time financial advisor and “prominent confidant” of both FDR and Churchill. Jerome Frank was a close aide, as was David Niles. James Warburg, son of Paul, was an early financial advisor. In May of 1934, Eugene Black was named Fed Chairman, and Jesse Straus was appointed ambassador to France—even as his nephew, Nathan Straus Jr., came to head the US Housing Authority. William Bullitt, a quarter-Jew, was given two critical ambassadorships: first to the Soviet Union, and then, during the war, to France. Laurence Steinhardt, who had helped so much with campaign funding, was awarded a string of ambassadorships throughout FDR’s tenure. Franklin’s old friend Herbert Lehman was appointed head of the new Office of Foreign Relief and Rehabilitation in 1943. Herbert Feis was an influential economics advisor for the State Department. Abe Fortas served as Undersecretary of the Interior. Charles Wyzanski was solicitor general in the Labor Department. Mordecai Ezekiel was economics advisor to the Agriculture Secretary. David Lilienthal became chairman of the TVA. Other Jews, like Sidney Hillman and Rose Schneiderman, emerged as important advisors on labor matters. On the second point, it is uncontroversial that Americans overwhelmingly wanted to avoid the war. In a radio address of 23 April 1941, the leading anti-war advocate, Charles Lindbergh, condemned the course of action “to which more than 80 percent of our citizens are opposed.” In an address the month before, Congressman Hamilton Fish stated that “somewhere between 83 and 90 percent of the people, according to the various Gallop polls, are opposed to our entrance into war unless attacked.”[ 23] The data supported such claims. According to surveys conducted in June and July 1940, between 81 and 86% of respondents preferred to “stay out” of a war, if it were to come up for a vote. Another poll in July 1941 registered a 79% figure. The highest recorded number came somewhat earlier, in a report published in mid-1938; when asked “If another war like the World War [I] develops in Europe, should America take part again?,” fully 95% of the respondents replied “No”. Such figures generally held up right until the attack on Pearl Harbor. The remaining points become clear, I think, simply by stepping through some key events and observations as they happened chronologically. As is well known, Jews worldwide confronted Hitler as soon as he assumed power in 1933—witness the infamous “Judea Declares War on Germany” headline in the UK’s Daily Express of 24 March 1933. In a sense, this was understandable. Putting an end to a post-World War I Weimar Republic dominated by Jews, Hitler quickly banished them from positions of power, and placed immediate restrictions on their movement and business activities. In fact, one may speculate that this was not unrelated to Germany’s amazing economic renaissance. 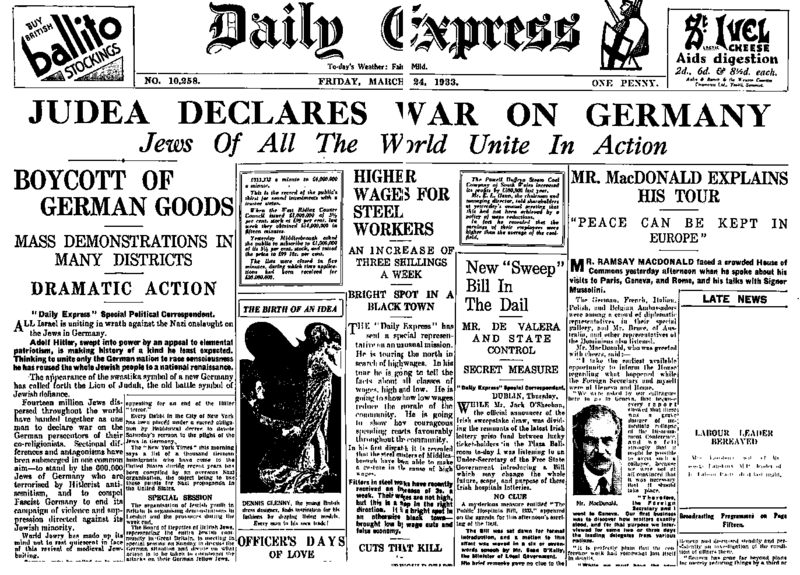 The UK’s Daily Express of 24 March 1933 runs the infamous headline, “Judea Declares War on Germany” announcing that Jews worldwide confronted Hitler as soon as he assumed power. But the Western media did not see it this way. As early as April 1933, the New York Times was reporting on the “economic extermination of Jews in Germany” (April 6). Two months later we read, simply, that “Hitler’s program is one of extermination” (June 29). In August, we are shocked to learn that “600,000 Jews are facing certain extinction” (August 16). Here we can graphically see how the ‘extermination’ myth rapidly evolved, from a plan of economic exclusion. By the mid-1930s, Germany was in the midst of their astounding economic recovery, one that was particularly striking given their ruination after World War I, and that it occurred during the Great Depression. Within just his first four years, Hitler had reduced unemployment from 6 million to 1 million; the jobless rate fell from 43.8% when he took office, to effectively zero by the end of 1938. In just four years, he increased GNP by 37%, and oversaw a 400% increase in auto production. In effect, he single-handedly ended the Depression in Germany. Two more years, and the nation would be a world power of the first rank. Germany thus emerged as a viable competitor to the traditional global powers. Churchill felt particularly threatened. In a congressional testimony, US General Robert Wood recalled a statement by the British politician from 1936: “Germany is getting too strong. We must smash her.” This suggests a belligerence on Churchill’s part long before any aggressions by Hitler. As we know: it was the UK that declared war on Germany, not vice versa. In October 1937, Roosevelt gave his famous ‘quarantine’ speech. Here we find one of the first indications, albeit indirect, that he anticipates a time when the US would come into direct conflict with Germany, and he subtly propagandizes the public in favor of war. The danger of Hitler is exaggerated; neutrality and isolation are disparaged; baseless assertions and cautiously conditional statements are thrown out—and all in the language of peace. Should Hitler prevail, “let no one imagine that America will escape, … that this Western Hemisphere will not be attacked.” “There is no escape through mere isolation or neutrality,” he said; “international anarchy destroys every foundation for peace.” “We are determined to keep out of war,” said FDR, “yet we cannot insure ourselves against the disastrous effects of war and the dangers of involvement.” Sparing no hyperbole, he added that, if Germany initiates a war, “the storm will rage till every flower of culture is trampled and all human beings are leveled in a vast chaos.” This is difficult to read except as an indication that the path of violent confrontation had already been decided upon, and that the long process had begun to persuade a reluctant public that they must support it. Such a view is confirmed in a letter by Senator Hiram Johnson (R-Cal. ), written to his son that same year. The pro- and anti-war camps were clear: “all the Jews [are] on one side, wildly enthusiastic for the President, and willing to fight to the last American.” Though sympathetic, Johnson had no interest in fighting a war on their behalf. He and other like-minded politicians wanted to speak out, “but everybody is afraid—I confess I shrink from it—of offending the Jews.” The situation has hardly changed in 75 years. For his part, Bernie Baruch was certainly itching for a fight. Speaking to General George Marshall, he said “We are going to lick that fellow Hitler. He isn’t going to get away with it.”One wonders how he would know this, in 1938. Actually, it’s not much of a mystery: Churchill apparently told him so. As Sherwood (1948: 111) recounts, Churchill—then still First Lord of the Admiralty—said this to Baruch: “War is coming very soon. We will be in it and you (the United States) will be in it. You (Baruch) will be running the show over there, but I will be on the sidelines over here.” This is an astonishing claim; how would Churchill know such a thing, in 1938? The Anschluss with Austria had been completed in March that year, and Germany annexed the Sudetenland in October, but the Munich Accord was signed in September, nominally preserving a kind of tenuous peace. So what could have convinced Churchill that war was inevitable, and that the Americans would be running the show? Kristallnacht, perhaps? Was that the last straw, for the global Jewish lobby? Beaverbrook was a prominent and influential media executive and politician, rather like the Rupert Murdoch of his day. He was well positioned to make such a claim. The year 1939 opened with FDR’s State of the Union speech—and more veiled threats. “We have learned that God-fearing democracies of the world…cannot safely be indifferent to international lawlessness anywhere. They cannot forever let pass, without effective protest, acts of aggression against sister nations.” He consequently called for an unprecedented peacetime allocation of $2 billion for national defense. A message to Hitler—and to all those Americans who might oppose intervention in European affairs. If the international Jewish financiers in and outside Europe should succeed in plunging the nations once more into a world war, then the result will not be the Bolshevization of the earth, and thus the victory of Jewry, but the annihilation [Vernichtung] of the Jewish race in Europe! Two quick comments: The German word ‘Vernichtung’ has multiple meanings, and in no way requires the killing of any persons in question. The literal meaning is “to bring to nothing.” More broadly it means to completely remove or eliminate the presence, role, or influence of something. And there are many ways to do this short of murder. But more to the point, Hitler’s alleged program of physical extermination was supposedly a great secret. He cannot possibly have told the world, in the most public of venues, of his ‘secret’ plan to kill all the Jews—in early 1939. Clearly he was referring to their displacement from Europe, and to an elimination of their previously dominant role there. But this was no secret at all—he had been doing that in Germany for some six years already. The prevalent hatred against everything which is in any way connected with German Nazism is further kindled by the brutal policy against the Jews in Germany and by the émigré problem. In this action, various Jewish intellectuals participated: for instance, Bernard Baruch; the Governor of New York State, Lehman; the newly appointed judge of the Supreme Court, Felix Frankfurter; Secretary of the Treasury Morgenthau; and others who are personal friends of President Roosevelt. They want the President to become the champion of human rights, freedom of religion and speech, and the man who in the future will punish trouble-makers. These groups of people, who occupy the highest positions in the American government and want to pose as representatives of ‘true Americanism’ and ‘defenders of democracy,’ are, in the last analysis, connected by unbreakable ties with international Jewry. For this Jewish international, which above all is concerned with the interests of its race, to portray the President of the United States as the ‘idealist’ champion on human rights was a very clever move. In this manner they have created a dangerous hotbed for hatred and hostility in this hemisphere, and divided the world into two hostile camps. The entire issue is worked out in a masterly manner. Roosevelt has been given the foundation for activating American foreign policy, and simultaneously has been procuring enormous military stocks for the coming war, for which the Jews are striving very consciously. If Potocki were correct, it would mean that war had effectively been decided upon by the Allied powers. And in fact, that’s exactly what Bullitt said to American journalist Karl von Wiegand: “War in Europe has been decided upon. Poland had an assurance of the support of Britain and France, and would yield to no demands from Germany. America would be in the war after Britain and France entered it.” Bullitt obviously had inside access to a well-developed plan, one that was proceeding apace. In July, Potocki was back in Warsaw, speaking with a foreign ministry undersecretary named Jan Szembek. In his diary, Szembek recorded Potocki as stating the following: “In the West, there are all kinds of elements openly pushing for war: Jews, big capitalists, arms dealers. Now they are all ready for some excellent business… They want to do business at our expense. They are indifferent to the destruction of our country.” This is notable, if only as confirmation of the legitimacy of the earlier reports. Around that same time, the American ambassador to Great Britain began to cause a stir. He was a member of the Boston-area Irish Catholic set, a successful businessman…and father of a future president. Joseph Kennedy contributed to Roosevelt’s 1932 presidential campaign, and was rewarded with the chairmanship of the SEC. He left that office in 1935, and was appointed ambassador to the UK in January 1938. 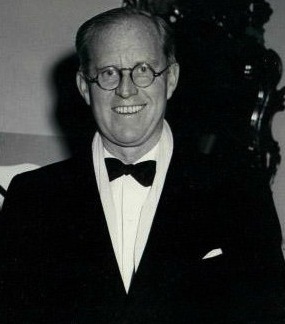 Photo of Joseph Kennedy in New York, 1 November 1940. At the time, Kennedy was the United States Ambassador to Great Britain. Amazingly, the president was unfazed. “It is true,” he said. Ickes provides no further information on the incident, and thus it is hard to know how to take this blunt response. Was FDR joking? A half-joke? An outright, straight-faced admission? We simply do not know. What was undoubtedly true, though, was that Kennedy had deep concerns about Jewish influence. He was not the only diplomat with such worries. A month later, reports Taylor (1961: 267), British ambassador to Germany Nevile Henderson told Hitler that “the hostile attitude in Great Britain was the work of Jews and enemies of the Nazis.” Here again we see a parallel action on both sides of the Atlantic, and possibly coordinated. This would be consistent with Baruch’s role as a “prominent confidant” of both Roosevelt and Churchill. A few weeks later, on September 2, the German army crossed into Poland. What began as part of a long-standing border conflict between two neighboring countries became, two days later, a European war, when England and France declared war on Germany. I hate war. I say that again and again. I hope the United States will keep out of this war. I believe that it will. And I give you assurance and reassurance that every effort of your government will be directed toward that end. As long as it remains within my power to prevent, there will be no black-out of peace in the United States. Here Roosevelt clearly reveals himself as a dissembler and a liar. Qualifications, conditionals, half-truths—all evidently designed to manipulate public opinion in favor of war. Jews inside and outside his administration had been pressing for intervention for years; now with actual combat underway, the pressure would rapidly escalate. Roosevelt knew this, but said nothing. After all, he was facing another election the following year, and had to publicly maintain an anti-war stance or risk losing to the Republicans. But he also had to keep his Jewish financiers happy. The fact that the vast majority of the American people were still strongly against the war apparently had no effect upon him—so much for democracy. Here we have an amazingly bald-faced admission. Churchill has utter contempt for the “tendencies” (read: democratic principles) of the Americans. His sole concern is to leverage Jewish power to draw a neutral nation into yet another major war, to save his skin and to aid his Zionist friends. Kennedy was naturally appalled—both that Churchill would do such a thing, and that it seemed to be working. “I don’t trust him,” he wrote in his diary; “He always impressed me that he was willing to blow up the American Embassy and say it was the Germans if it would get the United States in.” No doubt that was true—just as FDR would be willing to sacrifice some 2,400 American lives at Pearl Harbor for precisely that end. Into 1940, Hitler ran off an impressive string of victories, culminating in the capture of Paris in June. 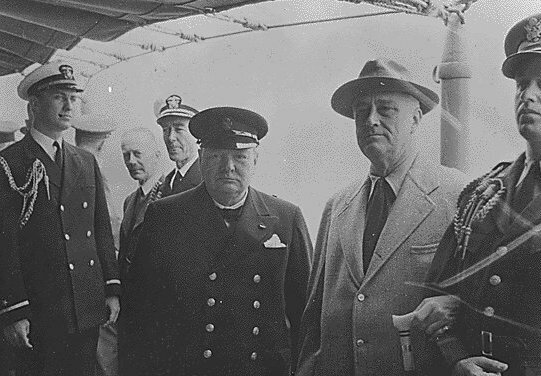 Chamberlain resigned as prime minister, to be replaced by Churchill, who immediately initiated the ‘bases for destroyers’ plan with the US (see above). As the year wore on, Roosevelt continued to lie to the American public. His campaign address in Boston on October 30 contained the same deceptive falsehoods of his earlier speeches. “Your government has acquired new naval and air bases in British territory in the Atlantic Ocean”—but no mention of the extralegal 50 destroyers that he gave them in return. He boasted of doubling the size of the army within the past year, and of letting out $8 billion in defense contracts. But not to worry, fellow Americans—“I give you one more assurance. I have said this before, but I shall say it again and again and again: Your boys are not going to be sent into any foreign wars.” An utter lie, and he knew it. One is perhaps tempted to make excuses for FDR: that he was morally torn, that he could see a larger danger that the public could not see, that he had to lie to us ‘for our own good.’ None of these withstands scrutiny. The ethics of warfare are fairly well established, at least for nominal democracies. They would include, at a minimum: proportionality, mutuality, direct threat, and public support. That is, (a) any aggressions should be responded to only with equivalent force, (b) rules for one party hold for all, (c) force is justified only in the face of a direct and imminent threat, and (d) the public must be given an honest appraisal of the situation, and its wishes respected. Suffice it to say that none of these conditions would hold. One wonders: If the public had known of the ultimate cost—some 420,000 American deaths, and roughly $4.2 trillion (present-day equivalent)—would they have embraced war, even after Pearl Harbor? Or would they perhaps have put FDR and his Jewish supporters on trial, for fraud, treason, and war crimes? Jewish population in the US, incidentally, was soon to reach 5 million. Frankfurter’s boys were doing a good job. So, we must ask: Why was the partly Jewish Bullitt—a mere diplomat—“urging” the president of the United States to face down Hitler? And why were Bullitt and Roosevelt “constantly needling” England and France to fight a war that they themselves did not see as necessary or winnable? And why did these nations succumb to American pressure? And why did Chamberlain ultimately link together America and “the world Jews” as the driving force for war? We need not look very hard to see a Jewish hand at work. Jewish-run media was becoming very active by this time. The newspapers, for example, had found much disagreement with Washington on domestic issues, but “Roosevelt’s standing with the press on foreign policy matters was much stronger,” according to Cole (1983: 478). Apart from the Chicago Tribune and the Hearst papers, most dailies backed intervention. Unsurprisingly, “the more prestigious and influential news publications strongly supported the president.” These included the New York Times, the New York Herald Tribune, the Chicago Daily News, and Time Magazine. The motion picture industry certainly did its part to get America into war. Given that it took at least a year to get a motion picture from conception to theater, and that efforts to produce pro-war films did not start in earnest until 1937, it was well into 1939 before they began to appear. Early efforts like Confessions of a Nazi Spy and Beasts of Berlin came out that year, and set the stage for a flood of films over the next three years. In 1940, Hollywood released graphic and high-impact films like Escape and Mortal Storm; Hitchcock’s Foreign Correspondent came out that year, as did Chaplin’s The Great Dictator. In May, two major studio heads, Jack and Harry Warner—more accurately known as Itzhak and Hirsz Wonskolaser—wrote to Roosevelt, assuring him that they would “do all in our power within the motion picture industry…to show the American people the worthiness of the cause for which the free peoples of Europe are making such tremendous sacrifices.” It’s nice to see such unselfish, high-minded public service amongst corporate executives. By early 1941, Jewish filmmakers and producers were working subtle, pro-war themes into many of their films. The anti-war group America First argued that belligerent propaganda was becoming widespread; “films that have nothing to do with the European war are now loaded with lies and ideas which bring about an interventionist reaction” (in Cole: 474). In August of that year—just one month before Pearl Harbor—Senator Gerald Nye (R-N. Dak.) delivered a stinging radio address, arguing that the Hollywood studios “had become the most gigantic engines of propaganda in existence, to rouse the war fever in America and plunge this nation to her destruction” (in ibid: 475). By that time, nearly three dozen major pro-war films had been released. In the end, more than 60 explicitly ‘patriotic,’ pro-war films were produced, along with dozens of ordinary films that incorporated subtle pro-war messages. There were a few classics—Casablanca, Sergeant York, To Be or Not to Be—and many duds. Hitler’s Children and Nazi Agent, for example, won’t be making any Top 10 lists. In March of 1941, under pressure from the Jewish lobby, Congress passed the Lend-Lease Act; this allowed shipment of armaments and military supplies to Britain and the other Allied nations. The vote was 260-165 in the House, and 59-30 in the Senate. Public opinion was narrowly in favor of the Act, but only as a defensive measure; a strong majority still wished to stay out of the war. FDR could arm the Allies but not join the fighting. In June, convinced of the Bolshevist threat posed by Stalin, Hitler invaded the Soviet Union. In August, the US placed military forces in Iceland, effectively occupying that country. And on 11 September 1941—60 years to the day before that other 9/11—Charles Lindbergh gave his most famous speech, at Des Moines, Iowa. There he called out for the first time the three main groups that were driving the US toward war: the British, the Roosevelt administration, and the Jews. Of this latter group, Lindbergh acknowledged their plight under the Nazis, and their hatred of Hitler. But instead of inciting America to war, they should be working to halt it; “for they will be among the first to feel its consequences”—presumably meaning both in Germany and in the US, where anti-Semitism would surely be inflamed. In one of the more notable lines of the speech, he said that “[The Jews’] greatest danger in this country lies in their large ownership and influence in our motion pictures, our press, our radio, and our government.” Lindbergh thus ran afoul of the first rule of wartime: Thou shalt never speak the truth. Indeed: If Jewish influence in “our government” was part of the danger, then naming the “Roosevelt administration” was redundant. The true danger was Jews in media, Jews in Hollywood, and Jews in the government—along with those non-Jews who worked on their behalf. And even to name the British—Churchill and his Zionist backers—was, in effect, to name yet more Jews. On all fronts, it was powerful and influential Jews driving peaceful people toward war, simply to destroy the hated Nazi regime. There is only one big ethnic group [in America] which is willing to stand, to a man, for Great Britain, and a policy of “all-out aid” for her: the five million Jews. From Secretary Morgenthau, Governor Lehman, Justice Frankfurter, down to the simplest Jewish workman or trader, they are conscious of all that this struggle against Hitler implies. A most explicit admission: American Jews, working in conjunction with British Jews, hold the key to war. They are “keen to do it.” Virtually upon command, they can “tip the scales”—again—and drive the Americans into another war that they desperately want to avoid. With American opposition to war still hovering near 80%, FDR and his Jewish team were evidently becoming desperate. Dramatic action was increasingly necessary. At that point, only a direct attack on American soil could alter public opinion. For a good two years, Roosevelt had been harassing the Germans. But they refused to bite. What to do? History is full of “false flag” operations in which governments or other actors conduct a fake attack, blame the enemy, and then use the event as a pretext for military action. By some accounts, the earliest was in 47 BC, when Julius Caesar arranged and paid for insurgent ‘rebel’ actions in Rome prior to his taking of the city. A more recent instance occurred in 1846, when President James Polk sent an army detachment into a disputed area along the Texas-Mexico border. When the Mexicans responded, he declared it an attack on “American soil,” and promptly began the US-Mexico War. For centuries, military commanders have understood the benefits of false flags; Roosevelt’s team was no different. Though I cannot elaborate here, there is ample evidence that the Pearl Harbor attack was effectively a false flag event. While obviously not directly conducting the attack, Roosevelt did everything possible to encourage and allow the Japanese to strike—and then to feign shock when it actually happened. Below are the key elements of that story. The earliest explicit indication that some such plan was in the works comes from October 1940, in the so-called McCollum Memorandum. Lt. Commander Arthur McCollum was director of the Office of Naval Intelligence’s Far East Asia section when he issued a five-page letter to two of his superiors. The memo describes a situation in which a neutral US is surrounded by hostile nations across two oceans, and notes that “Germany and Italy have lately concluded a military alliance with Japan directed against the United States.” This was a mutual-defense pact, such that an attack against Japan would be considered by Germany to be an act of war. This gave FDR two paths to war: attack by Germany, or attack by Japan. Germany was scrupulously eschewing conflict, but perhaps Japan could be engaged. This was evidently well understood within the military establishment. As McCollum explained, “It is not believed that in the present state of political opinion, the US government is capable of declaring war against Japan without more ado; and it is barely possible that vigorous action on our part might lead the Japanese to modify their attitude”—clever language that essentially means: Japan does not really want war either, but perhaps we could provoke them enough (“more ado”) that they would launch a first strike (“modify their attitude”). McCollum then suggested an eight-point action plan, anticipating conflict with Japan. Item Six includes this: “Keep the main strength of the US fleet now in the Pacific in the vicinity of the Hawaiian Islands.” The memo concludes with this striking sentence: “If by these means Japan could be led to commit an overt act of war, so much the better.” The plan could hardly be clearer. [Roosevelt] was obviously determined that they [the US] should come in. … The president said to me that he would wage war but not declare it, and that he would become more and more provocative. If the Germans did not like it, they could attack American forces. … Everything was being done to force an ‘incident.’ The president has made it clear that he would look for an ‘incident’ which could justify him in opening hostilities. Lindbergh essentially understood what was going on. In his September 1941 speech, he laid out FDR’s three-part plan: (1) prepare for war in the guise of defense, (2) incrementally involve the US in conflict situations, and (3) “create a series of incidents which would force us into actual conflict.” Near the end of his speech he added that “The war groups have succeeded in the first two of their three major steps into war. … Only the creation of sufficient ‘incidents’ yet remains.” An amazing prognosis, given that the Pearl Harbor attack was just three months away. [Roosevelt] brought up the event that we were likely to be attacked perhaps next Monday [December 1], for the Japanese are notorious for making an attack without warning, and the question was how we should maneuver them into the position of firing the first shot without allowing too much danger to ourselves. It was a difficult proposition. This is Stimson’s infamous “maneuver” remark; once again, it is clear and explicit. The following day, November 26, Secretary of State Hull presented a letter to the Japanese ambassador, demanding that they withdraw from China and French Indochina (section II, point #3). Though couched in the language of peace, it was effectively an ultimatum, and it was thusly perceived by the Japanese prime minister. On December 4, the anti-war paper Chicago Daily Tribune ran a huge headline: “FDR’s War Plans!” It detailed a plan for a 10-million-man military force, half of whom would be dedicated to fighting Germany. It even mentioned a specific date—1 July 1943—as the day for the “final supreme effort by American land forces to defeat the mighty German army in Europe.” This was incredibly accurate; the Allied invasion of Sicily, the first direct assault on European territory, occurred on 9 July 1943. Clearly FDR’s secrets were quickly unraveling. At 4:00 pm on Saturday, December 6, a decoded Japanese communiqué was delivered to Roosevelt. It indicated that Japan was not going to accept any portion of America’s ultimatum, and that they were compelled to respond to its on-going belligerence. “This means war,” said the president. If war was inevitable, said Harry Hopkins, it was too bad that we couldn’t strike first. “No, we can’t do that,” said Roosevelt, hypocritically; “We are a democracy of a peaceful people. We have a good record. We must stand on it.” Pearl Harbor was not explicitly mentioned, but the president took no action to forewarn any of his commanders in the Pacific theater, thus rendering them defenseless before the oncoming assault. Eight years after the attack, the president’s administrative assistant, Jonathan Daniels, recalled events of that time. “There was a mass of warning before Pearl Harbor,” he wrote (1949: 490). “As a matter of fact, warning had been clear for many months before Pearl Harbor. The increasing menace had been understood and accepted. Of course, even Senators can now read to precise clarity—to the place and the hour—the warnings we possessed.” At the time, though, Roosevelt was surprised: “Of course, he was surprised. But he had deliberately taken the chance of surprise, as he had won the strategy of successful militant delay. The blow was heavier than he had hoped it would necessarily be.” Indeed—2,400 Americans killed in one day. Or perhaps it was no “surprise” at all. In 1989, a 90-year-old British naval intelligence officer named Eric Nave came forth with a stunning assertion: that the Brits had detailed foreknowledge of the attack, days before the event. As reported in the Times of London (June 1), Nave’s decoding of Japanese battle commands made “clear their intention to attack several days before the raid took place.” “His revelations challenge the view that the Americans were taken by surprise, and support evidence that Churchill, and probably Roosevelt, allowed the attack to go ahead unchallenged as means to bring America into the Second World War.” Nave added this: “We never had any doubt about Pearl Harbor itself. It should never have happened. We knew days, even a week before.” His account is detailed in his book Betrayal at Pearl Harbor (1991). Nave died in 1993. On 19 August 1941, Churchill told his war cabinet that Roosevelt was doing all he could to provoke an attack by the Axis powers. Photo: August 1941. This essay has been a study in history. But we must never forget: History is suffused with lessons for the present. What, then, can we conclude from this long and tragic story? First: Wars are complex events, and all complex events have multiple causes. They are generally the result of an accumulation of tensions and conflicts over several years. It would be all but impossible for any one group, no matter how influential, to precipitate war if the conditions were not already favorable. But a small group can certainly heighten existing tensions, or serve as a trigger, or exacerbate an ongoing conflict. It would be misleading to say that Jews “caused” World War I, or the Russian Revolution, or World War II—though they certainly had a significant influence on all these events, and arguably a decisive influence. Clearly they are not the sole cause of the wars under review. It is not as if, were there no Jews at all, fighting in Europe would never have occurred. There were, for example, many non-Jewish belligerents on all sides during World War II, including Lord Halifax in England, and Stimson among the Americans. Military men always have an inclination to fight; after all, their very positions and prestige depend upon it. Counterfactuals are notoriously difficult to apply to historical events: What if Jewish rebels and Weimar reconstructionists had not dominated post-World War I Germany? What if Roosevelt had not relied upon Jewish money to finance his campaigns? What if Churchill had not been a Zionist? What if Ben Cohen’s “bases-for-destroyers” plan had failed? We obviously can never know these things; but it is clear that Jews were active and instrumental at several critical junctures on the path to war. And indeed, this is one of the most striking facts: that Jews were so active, at so many points along the way, that we can scarcely avoid attributing to them a significant portion of blame for the world wars and accompanying revolutions. Thus we see something of a long-term trend: Unethical, unprincipled, deceptive American presidents, who are “swayed by their Jewish elements” (Dillon), to lead an unwilling nation into battle against sovereign countries that are deemed to be enemies of the Jews. The parallels to the past 25 years are striking. Bermant, C. 1977. The Jews. Times Books. Beschloss, M. 2002. The Conquerors. Simon and Schuster. Brecher, F. 1988. “Charles R. Crane’s crusade for the Arabs.” Middle Eastern Studies, 24(1): 42-55. Breitman, R. and Lichtman, A. 2013. FDR and the Jews. Belknap. Bryant, A. 1940. Unfinished Victory. Macmillan. Buchanan, P. 2008. Hitler, Churchill, and the Unnecessary War. Crown. Cecil, L. 1996. Wilhelm II (vol. 2). University of North Carolina Press. Chalberg, J. (ed.) 1995. Isolationism. Greenhaven. Churchill, W. 1920/2002. “Zionism versus Bolshevism.” In L. Brenner (ed. ), 51 Documents, Barricade. Cohen, M. 1985/2003. Churchill and the Jews. F. Cass. Cole, W. 1983. Roosevelt and the Isolationists. University of Nebraska Press. Dall, C. 1968. FDR: My Exploited Father-in-Law. Action Associates. Dallek, R. 1979. Franklin D. Roosevelt and American Foreign Policy. Oxford University Press. Dalton, T. 2009. Debating the Holocaust. Theses and Dissertations Press. Dalton, T. 2010. “Goebbels on the Jews” (part 2). Inconvenient History, 2(2). Daniels, J. 1949. “Pearl Harbor Sunday: The end of an era.” In Leighton (ed. ), The Aspirin Age, Simon and Schuster. Dillon, E. 1920. The Inside Story of the Peace Conference. Harper and Brothers. Dodd, W. 1941. Ambassador Dodd’s Diary, 1933-1938. Harcourt, Brace. Doenecke, J. 2000. Storm on the Horizon. Rowman & Littlefield. Dunn, S. 2013. 1940: FDR, Willkie, Lindbergh, Hitler. Yale University Press. Fay, S. 1928. The Origins of the World War. Macmillan. Fink, C. 1998. “The minorities question.” In Boemeke et al (eds), The Treaty of Versailles, Cambridge University Press. Forrestal, J. 1951. The Forrestal Diaries. Viking. Fuller, J. 1957. The Decisive Battles of the Western World (vol. 3). Eyre & Spottiswoode. Reprinted in the United States as A Military History of the Western World (vol. 3), Minerva. Grubach, P. 2011. “Churchill, international Jews, and the Holocaust: A revisionist analysis.” Inconvenient History, 3(1). Herzstein, R. 1989. Roosevelt and Hitler. J. Wiley. Ickes, H. 1954. The Secret Diary of Harold L. Ickes (vol. 2). Simon and Schuster. Jackson, R. 2003. That Man: An Insider’s Portrait of Franklin D. Roosevelt. Oxford University Press. Katz, S. 1991. “1918 and after: The role of racial anti-Semitism in the Nazi analysis of the Weimar Republic.” In Gilman and Katz (eds), Anti-Semitism in Times of Crisis, NYU Press. Laqueur, W. 1974. Weimar: A Cultural History. Putnam. Lavsky, H. 1996. Before Catastrophe. Wayne State University Press. Leutze, J. 1975. “The secret of the Churchill-Roosevelt correspondence.” Journal of Contemporary History, 10(3). Loewenheim, F. et al (eds). 1975. Roosevelt and Churchill. Saturday Review Press. Michael, R. 2005. A Concise History of American Anti-Semitism. Rowman & Littlefield. Morgenstern, G. 1947. Pearl Harbor. Devin-Adair. Morgenthau III, H. 1991. Mostly Morgenthaus. Ticknor & Fields. Mowrer, E. 1933. Germany Puts the Clock Back. William Morrow. Muller, J. 2010. Capitalism and the Jews. Princeton University Press. Nasaw, D. 2012. The Patriarch. Penguin. Nave, E. 1991. Betrayal at Pearl Harbor. Summit. Rohl, J. 1987/1994. The Kaiser and His Court. Cambridge University Press. Scholnick, M. 1990. The New Deal and Anti-Semitism in America. Taylor and Francis. Sherwood, R. 1948. White House Papers of Harry L. Hopkins (vol. 1). Eyre & Spottiswoode. Stinnett, R. 2001. Day of Deceit. Touchstone. Szembek, C. 1952. Journal 1933-1939. Plon. Taylor, A. 1961. Origins of the Second World War. Atheneum. Townley, S. 1922. Indiscretions of Lady Susan. Appleton. Ward, G. 1989. A First-Class Temperament. Harper & Row. Weber, M. 1983. “President Roosevelt’s campaign to incite war in Europe.” Journal of Historical Review, 4(2). Wentling, S. 2012. Herbert Hoover and the Jews. Wyman Institute. As Baruch stated to Congress, “I probably had more power than perhaps any other man did in the war; doubtless that is true.” See Part 1 for his full testimony. The New York Times carried periodic such reports. See, for example: 26 January 1891 (“Rabbi Gottheil says a word on the persecution of the Jews…about six millions persecuted and miserable wretches”), 21 September 1891 (“An indictment of Russia…a total of 6,000,000 is more nearly correct.”), 11 June 1900 (“[In Russia and central Europe] there are 6,000,000 living, bleeding, suffering arguments in favor of Zionism.”), 23 March 1905 (“We Jews in America [sympathize with] our 6,000,000 cringing brothers in Russia”), 25 March 1906 (“Startling reports of the condition and future of Russia’s 6,000,000 Jews…”). The situation led a former president of B’nai B’rith to a prophetic exclamation: “Simon Wolf asks how long the Russian Holocaust is to continue” (10 November 1905). History does indeed repeat itself. It seems that he had good reason for this enmity. According to Cecil (1996: 57), Wilhelm “believed that Jews were perversely responsible…for encouraging opposition to his rule.” In a letter to a friend, the Kaiser wrote: “The Hebrew race are my most inveterate enemies at home and abroad; they remain what they are and always were: the forgers of lies and the masterminds governing unrest, revolution, upheaval by spreading infamy with the help of their poisoned, caustic, satyric spirit” (in Rohl 1994: 210). Townley (1922: 45) relates this comment of his: “The Jews are the curse of my country. They keep my people poor and in their clutches. In every small village in Germany sits a dirty Jew, like a spider drawing the people into the web of usury. He lends money to the small farmers on the security of their land, and so gradually acquires control of everything. The Jews are the parasites of my Empire.” He adds that the Jewish question is one of his “great problems,” but one in which “nothing can be done to cope with it.” In 1940, with Hitler moving to clean up Europe, he said this: “The Jews are being thrust out of the nefarious positions in all countries, whom they have driven to hostility for centuries” (in Rohl: 211). A good, brief account is given in MacMillan (2003: 463-466). Cited in MacMillan (2003: 414-415). Muller adds, “The prominence of Jews in the Hungarian Soviet Republic is all the more striking when one considers that the Jews of Hungary were richer than their coreligionists in Eastern Europe… Though only 5% of the population, on the eve of WWI, Jews made up almost half the doctors, lawyers, and journalists in Hungary.” But this is precisely as I have said: no amount of wealth or social status is sufficient, if Jews lack political power. Until his assassination in June 1922. For one account, see Darkmoon (2013). Also see Bryant (1940: 142-145). In my notation, (I.5) refers to Volume I, chapter 5. I use the Murphy translation. See Part I for an elaboration. Ford’s so-called “Peace Ship” sailed to Norway in December of 1915, in a failed attempt to negotiate an end to the war. Cited in Shogan (2010: 51). Cited in Ward (1989: 253). See also Morgenthau (1991: 169 facer). Various other extremist writings have also claimed that the Delano family (Franklin’s mother’s side) were Jews. They construct a parallel account to the Rossacampo story, and of dispersion from Spain or Italy. But I find no evidence to verify this claim. This recalls the similar characterization of Baruch during World WarI. The first Jewish cabinet member, as we recall, was Oscar Straus, selected by Franklin’s cousin Theodore back in 1906. Bullitt’s heritage is somewhat cryptic. His mother, Louisa Horowitz, was apparently at least half-Jewish. Her father, Orville Horowitz, descended from the Salomon family, who were distinctly Jewish. Her mother, Maria Gross, likely had a mixed Jewish heritage. But there is no doubt where his sympathies lay; “Bullitt [is] a friend of ours,” wrote Weizmann in 1938 (cited in Nasaw 2012: 358). Though scandalous at the time, such level of Jewish influence is commonplace today—with three of nine Supreme Court Justices being Jewish (Kagan, Breyer, Ginsburg), numerous Cabinet-level appointments, and countless subordinate positions. Over just the past three presidential administrations, Jewish and part-Jewish Cabinet-level office holders include, at a minimum, the following: M. Albright, L. Aspin, C. Barshefsky, S. Bodman, J. Bolten, A. Card, M. Chertoff, W. Cohen, R. Emanuel, M. Froman, J. Furman, T. Geithner, D. Glickman, M. Kantor, J. Kerry, A. Krueger, J. Lew, M. Markowitz, M. Mukasey, P. Orszag, P. Pritzker, R. Portman, R. Reich, R. Rubin, S. Schwab, M. Spellings, J. Stiglitz, L. Summers, J. Yellen, and R. Zoellick. This list does not include others, such as Samantha Power, who have a Jewish spouse (Cass Sunstein). Nor does it include Chairmen of the Federal Reserve—a very powerful office, held by Ben Bernanke and Alan Greenspan during the past several years, and currently by Janet Yellen. Both citations from Chalberg (1995: 192-193). Public Opinion Quarterly, 4(4), December 1940: 714. Public Opinion Quarterly, 5(4), Winter 1941: 680. Public Opinion Quarterly, 2(3), July 1938: 388. By late 1936, the “600,000” had evolved into “6 million.” In the New York Times (Nov. 26) we read this: “Dr. 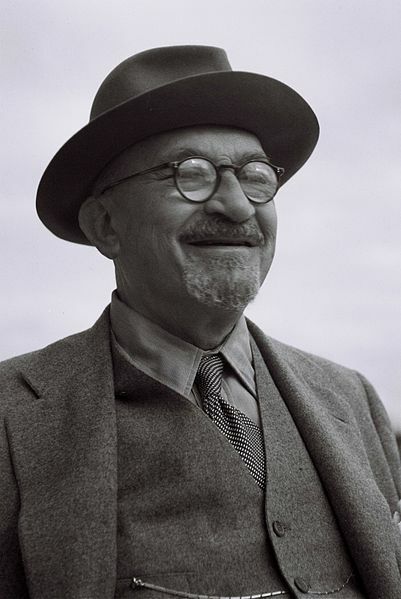 Weizmann dwelt first on the tragedy of at least 6,000,000 ‘superfluous’ Jews in Poland, Germany, and Austria…” It was even more explicit by early 1938: “Persecuted Jews Seen on Increase…6,000,000 Victims Noted” (Jan. 9)—this, a full four years before the alleged “death camps” even began operation. Cited in Herzstein (1989: 33). The New York Times had long been under Jewish control. The Post was purchased by Eugene Meyer in 1933. See Dalton (2010) for an elaboration of Goebbels’s views. Testimony of February 1941. Cited in Doenecke (2000: 440). See also Fuller (1957, vol. 3: 369). Cited in Weber (1983). This and other reports by Potocki were acquired by the Germans upon capture of Warsaw, and thus there is some skepticism about their authenticity. Weber makes a good case that they are genuine. David Irving reports that he saw copies of the original in the Hoover Library (http://www.fpp.co.uk/History/General/Potocki/papers.html). Cited in Cole (1983: 308). Cited in Fuller (1957: 370). Traditional references to Kristallnacht often overlook the fact that the event was triggered by a Jewish youth, Herschel Grynszpan, who murdered German Diplomat Ernst vom Rath in Paris on November 9. Kristallnachtfollowed the next day. See Weber (1983) and Fuller (1957: 372-374). Cited in Fuller (1957: 375). As recorded by Ickes in his personal diary, for July 2. See Ickes (1954: 676). Obviously there is more detail to the outbreak of war than I can provide here. In brief, once Poland received a guarantee of military support from England in March of 1939, they became increasingly belligerent toward German minorities on Polish soil, particularly in Danzig. It seems bizarre in hindsight, but many of the Poles (Potocki excepted), with the Brits at their back, were virtually spoiling for a fight with Germany. They believed that a victory would solidify their national standing, and help to ward off the Soviet threat to the east. Instead, they succumbed to the German assault in just four weeks. Cited in Nasaw (2012: 429). Cited in Cohen (2003: 195). Churchill himself was a Zionist—a fact that he openly admitted. In a letter of 1942 to Roosevelt, Churchill said, “I am strongly wedded to the Zionist policy [in the UK], of which I was one of the authors” (in Loewenheim 1975: 234). Speaking in 1950 on behalf of the creation of Israel, he said that it was “a great event in the history of mankind,” and that he was “proud of his own contribution towards it.” He added that “he had been a Zionist all his life” (in Cohen 2003: 322). Cited in Doenecke (2000: 198). Cited in Dunn (2013: 48). Including Beasts of Berlin, Espionage Agent, Arise My Love, British Intelligence, Escape to Glory, Murder in the Air, Waterloo Bridge, All Through the Night, Confirm or Deny, International Squadron, Joan of Paris, Man at Large, Man Hunt, One Night in Lisbon, Paris Calling, So Ends Our Night, Sundown, Underground, and World Premiere. For a full account, see Stinnett’s book Day of Deceit (2001). Chicago Tribune (2 January 1972; p. A22). See also New York Times (1 January 1972; p. 7). Cited in Jackson (2003: 247). See also Morgenstern (1947: 292). See New York Times (16 February 1946; p. 1). Cited in Shogan (2010: 33). In the words of Dallek (1979: 31). According to Breitman and Lichtman (2013: 6).